A bright yellow streak on the triangular head of the Diamondback Rattlesnake glistened in the sunlight as my father held out his hand. 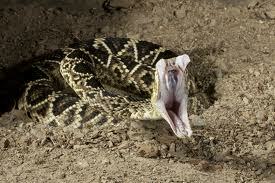 The snake’s mouth opened wide; huge yellow, needle-sharp fangs wet with saliva emerged fully from the sheath of skin. At twelve years old, my father’s hand trembled as the sound of the rattles grew louder and louder. Grey’s assistant held the neck and the midsection of the seven-foot reptile. My father held a large piece of balsawood. The handler guided the snake’s mouth toward the wood and the fangs struck quickly and lodged in the wood. The handler carefully moved the head back and forth and sideways, as he milked the deadly poison into a glass container, held below the snake’s head by Zane Grey. A circle of seventh grade students from Washington Junior High School gathered around my father and Zane Grey and the snake. There was only the sound of the rattles. No one was breathing. “Thank you Lyle. You have steady hands. All of you young people here know what this is. This is a Western Diamondback Rattlesnake, Crotlus atrox. You have probably seen this snake slithering in your own backyards, because most of you live up close to these mountains of Altadena. But don’t bother these guys. They help your moms and dads by eating mice and rats and gophers. They won’t bother you unless you bother them. So if you see one on the trail up to Echo Mountain, what do you do? This was one of the encounters my father had with Zane Grey. 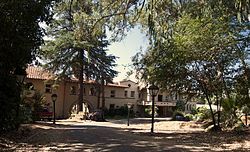 Later on at John Muir Technical High School, Grey’s son Loren Grey, would become a close friend and mentor to my Dad. Loren was a couple of years older and a terrific amateur photographer. He worked with my Dad on the student newspaper and yearbook. 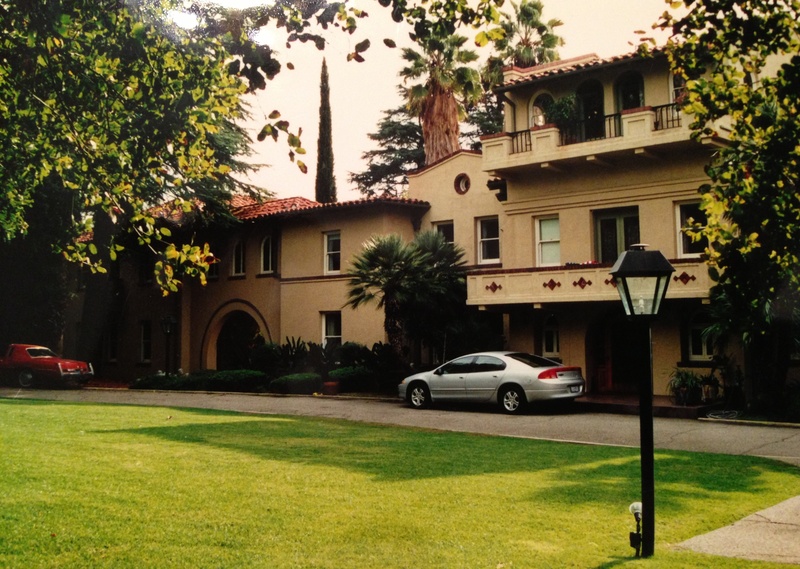 My father remembers many visits to the home of Zane Grey, at the foot of Echo Mountain in Altadena. He remembers the menagerie of local animals in the back yard like that rattlesnake, and the trophy heads of wild boar, mountain lion and grizzly bear hanging from the adobe walls of the home of the famous western writer. As a teenager, I remember bathroom cupboards stuffed with tattered copies of Zane Grey novels. Our father traveled throughout Latin America for most of his career as a contractor and field engineer. These books had a special attraction for him. What was it about Zane Grey that captured by father’s loyal devotion as a reader? I imagine my Dad on long flights to Colorado or Mexico or Venezuela, reading the stories again and again. Where did it take his mind? It seemed to give him a sense of serenity and peace. I watched him pack his suitcase methodically for the long trips. Always a copy of a Zane Grey western. He traveled to remote places in South America to help with concrete pump projects. I remember stories about taking off in a plane during a thunderstorm from the airport in Quito, Ecuador. The end of the runway was a cliff that dropped thousands of feet. Today at 95, he recalls details from these adventures, but mostly the loneliness, missing the family. As he read Wanderer of the Wasteland or Desert Gold, following the solitary travels of the protagonist, who wandered desert sand dunes, evading a posse, did his own long journeys through desert mountain roads and dense jungles connect with these stories. I am thinking that for my father, who was not an overtly religious person, reading the stories of his friend Zane Grey was his spirituality. The novels soothed the fires that burned within him. He found literary figures he could deeply identify with. Traveling north on 395 through Lone Pine, turn left at Whitney Portal Road, which ends at Whitney Portal, the base camp for climbing Mount Whitney. Horses graze in pastures as the road winds and climbs through a notch in the Alabama Hills. Gnarled, weirdly shaped boulders loom above us on both sides of the road. At some point, you will recognize the location of a scene in the movie Tremors. The road levels out and the landscape expands to a 180 degree vista. Turn right at Movie Road, drive a hundred yards or so, pull over, get out of your car and look! There is that iconic view of the Sierra Nevada and Mount Whitney. Tony Stark/Robert Downey, Jr. stood close to your location as the hero of the movie Iron Man, demonstrating the power of his exploding weapons. You are on the natural landscape stage that birthed the Western films of Zane Grey and many modern films as Gladiator, Lone Ranger, Man of Steele, Django Unchained and Star Trek. Over there Roy Rogers chased cattle rustlers. Gene Autry sang a cowboy ballad sitting on his horse over there amidst that cluster of rocks. In that canyon of boulders the British army marched forth to the shrill sound of bagpipes, in Gunga Din. You can visit the Lone Pine Film History Museum at the southern entrance of the town to see exhibits about all the Western films created in this womb of Hollywood imagination. They now have guidebooks with detailed directions inviting you to become a film detective in search of the locations of famous movies. Walk with me toward that cluster of boulders. A cold wind blows. As we enter the shelter of the rocks, the air becomes still and quiet. Whenever I come out here, I usually am alone. As I consider the romance of memories of the film stars who rode here, John Wayne, Gary Cooper, Clark Gable, Randolph Scott, and Gregory Peck, I sense the solitude of the western hero. 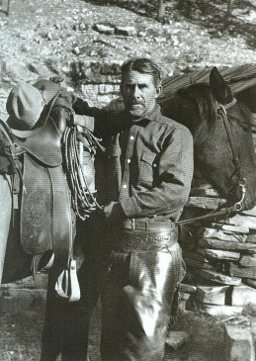 Stephen L. Tanner, writes in “Spiritual Values in the Popular Western Novel” (Literature and Belief 21:1&2 2001) about Owen Wister and Zane Grey: they had experienced the West first hand in the early 20th Century. For Zane Grey, encountering raw Nature in the West was renewing and revitalizing, purging the soul from sin and sorrow. Grey’s spirituality of the West did not come from orthodox Christianity. It was shaped by romantics like Rousseau, Emerson and Thoreau. The hero of Zane Grey’s novels retreated into the desert, often pursued by others or running away from personal tragedy. As you read Zane Grey’s western novels, spiritual revelation happens when blasting desert heat and wilderness deprivation strip away at the patina of civilization. Filters inhibiting intuitive communion with Nature fall away, and the hero finds redemption and salvation. The “Western” is a unique genre of literature evoking the vast landscape of the West. Tanner recalls Zane Grey’s first journey west to Arizona, which sparked his imagination. He met a Mormon named Jim Emmet who taught him how to be present to Nature in quiet, attentive observation, opening Grey’s heart to the enchantment of the landscape. Shepherd of Guadeloupe (1930) and Wanderer of the Wasteland are two of Zane Grey’s novels that tell of solitary men who come West to be healed or find redemption after an act of violence. Forrest becomes a shepherd, whose work involves solitude. He thought that God had abandoned him, but as his heart opened to intuitive communion with nature he received new eyes to perceive wonder and enchantment around him. These are the ingredients for a desert mystic. His solitary life in the desert soothed the painful memories of the past and awakened “a spiritual consciousness stronger than anything in primal nature. While there was life there was hope, good, truth, joy and God” (p. 204. The Shepherd of Guadaloupe, 1930. New York: HaperPaperbacks, 1992. As Zane Grey writes about the West, the spiritual power of Nature and landscape are the healing and redemptive resources of the Holy. The Braniff Airlines flight from Mexico City to Quito, Ecuador tries to fly over a storm, but the clouds are expansive. As the plane tosses and shakes, my father reads another tattered Zane Grey western novel. Reading Grey’s stories calmed him amidst the storms of life. While his business trips to exotic locations could be exciting and surprising, how he missed our family! The long separation and the solitude wore on his soul. As he read about wandering desert heroes of Grey’s writing, did he find a setting wherein he could work with his own burden of solitude? The Western Channel on our cable television network now brings me 24-hours of access to Western film and the stories of Zane Grey. Our new HD TV presents vivid images of John Ford’s landscapes of desert and Monument Valley. Like no other genre of film, the Western resonates with a visceral longing for something. What is it? Do you ever have that feeling? Our busy lives, Iphones and Ipads wear down our attention. Stress comes at us from all sides. Even in retirement, tension continues. We all long for a peaceful place apart, of solitude and quiet, where we can rest. I can calendar another desert retreat to the Owens Valley or Mojave Desert when I can commune again with the Holy Presence. I can do all the preparations, pack all the necessities and plan for a good retreat. But that doesn’t mean that in the desert retreat I will make a connection with the Holy. Ron Rolheiser writes, “Solitude cannot be so easily programmed. It has to find us, or, more accurately, a certain something inside us has to be awaked to its presence.” (“Longing for Solitude”, 2012-07-01). When I go on a desert retreat in the Owens Valley, I plan at least three days. The first day or two, walking alone on crunching desert sands, I will be alone. The busy mind will continue to spin out memories, conflicts and work undone. So much chatter going on. The physical exertion of long walks, climbing up mountain trails, slows my mind down so that I can become more attentive to the present moment, what is happening right in front of me. Often by the third day, solitude seeps in and my senses awaken to the deeper tastes, touch, smells and sounds of the natural world around me: the gateway to wonder and the embrace of the Holy. “Spiritual Values in the Popular Western Novel,” Stephen L. Tanner (Literature and Belief, 21:1 & 2 2001: Brigham Young University). “The Man Who Influenced Me Most”, American Magazine, August 1926, p. 136. The Philosophy of the Western, Jennifer McMahon and Steve Csaki ed, (2010: The University Press of Kentucky). http://framework.latimes.com/2013/04/30/alabama-hills/#/0 (Los Angeles Times article and video about the Lone Pine Film History Museum. This entry was posted in Blog and tagged Alabama Hills, desert spirituality, John Wayne, Lone Pine Film History Museum, mysticism, nature, solitude, Western Film, Zane Grey. Bookmark the permalink. Thanks. Great. So well done. Thanks. Great piece. I tweeted it. Thanks for reminding me that, “solitude cannot be so easily programmed.” It often has to be an intentional effort.